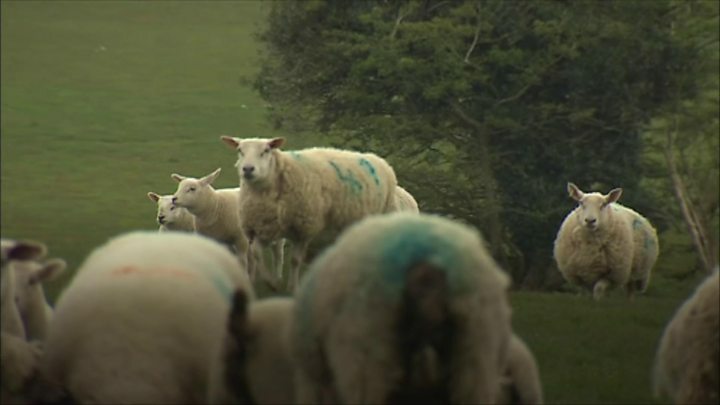 Media caption"I've never seen or witnessed anything like it before"
Laws on livestock attacks are not working and need to be changed, say a farming couple who have become one of Wales' latest victims. Robert Jones and partner Marie Wilson lost four ewes and four lambs in a dog attack at their farm on Anglesey. The couple are taking medication to help them sleep since the attack. The pair have been backed by Rob Taylor, who manages two of Wales' rural crime teams. He said police needed more powers to tackle the issue. "We came out in to this field and it was utter devastation," said Ms Wilson, who was hand-feeding newborn lambs when a neighbour raised the alarm. "I've never seen or witnessed anything like it before - I wouldn't want to witness it again. Very traumatic. Heartbreaking." The ewes and lambs in the field opposite their farmhouse had been chased into hedges by what is thought to have been two dogs. Some of the sheep were ripped apart and died on the spot. "All the animals that were attacked with injuries were put down. It was just such a sad ending to what had been a pretty good day on the farm," added Ms Wilson. Their vet told them it was the worst dog attack he had witnessed in his career. A neighbouring farm lost three ewes and six lambs in the same attack. It took place while Wales were winning their Grand Slam Six Nations game against Ireland - but four weeks later, the farming couple, from Rhosybol near Amlwch are still affected by the attack.. They have had to get prescriptions from their family doctor to help them sleep. "Lying in bed at night with the images, and then not only that, thinking 'Oh my god. what if it happens again', and then still getting up the next morning to carry on working on the farm. It's not an easy thing," said Ms Wilson. Neither the dogs nor their owners have been formally identified or prosecuted. The attack is one of 40 so far this year in north Wales. A further 48 have been reported in the Dyfed-Powys Police force area, while the Gwent Rural Crime Team said it continued to experience about 15 sheep-worrying cases a month. South Wales Police said livestock worrying remained "a significant issue" for farmers, and has increased the number of officers and support officers trained in wildlife crime. Rob Taylor, the team manager for North Wales and Dyfed-Powys rural crime teams, said the number of attacks already in 2019 suggested it could become a record year for incidents. He said it also highlighted shortcomings in current livestock attack legislation. The main law - the Dogs (Protection of Livestock) Act - was passed in 1953. Mr Taylor said it meant advances in DNA testing were not reflected in law, with police having no powers to take a sample from a dog suspected of worrying livestock. He said they have no powers of seizing a dog known to have attacked livestock under that legislation, and no clear definitions on which animals were actually protected - animals such as llamas or alpacas for example, which are growing in popularity on farms. "We've gone down the road of education, we've produced films and documentaries and posters, and tried to educate the public. However, people aren't listening," Mr Taylor said. "We've come to the point where the law needs changing, we need stiffer sentences, we need banning orders on people in regards to these offences. "We need to push on and wave that big stick, unfortunately, and make a big difference." Farming unions have also backed the call for a change in the law. The Farming Union of Wales said it wanted to see tougher penalties for owners - with the current limit being a £1,000 fine. It has also called for all police in Wales to be forced to record livestock attacks - it is only done on a voluntary basis at the moment. "There is growing frustration and anger amongst our membership that very little can be done to protect the livestock sector from dog attacks," said the union's senior policy officer, Dr Hazel Wright. "Where dog attacks do occur, farmers should be able to rely on the legal system to protect their livelihoods and safeguard their business by acting as a proper deterrent." Any changes to the laws would require new legislation passed through Parliament as it is not an issue that has been devolved to the Welsh Government. However, the Department of Environment, Food and Rural Affairs said police already had more powers to tackle livestock concerns under dangerous dog laws. "It is a criminal offence to allow any dog to be dangerously out of control," a UK government official said. "The Dangerous Dogs Act 1991 includes provisions to prosecute owners whose dogs kill, attack or chase animals, and to seize the dogs if they are out of control."